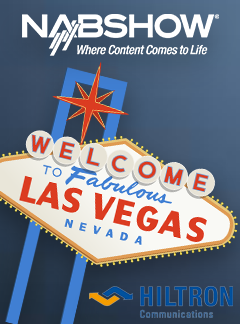 Stuttgart, Germany, March 26, 2018 – Senior management from Hiltron Communications are heading to Las Vegas for the April 7-12 NAB Show and its parallel conference. Held at the 2 million square foot Las Vegas Convention Center, NAB is this year expected to attract over 100,000 attendees from the broadcast, telecommunications and wider electronic-media sectors around the world. "Our business activity in the Americas is growing rapidly thanks in good measure to business links established at events such as NAB," comments Hiltron Managing Director Antonio Monteverde." "In our role as a satcom systems integrator, we have completed successful projects with many US-based companies for customers around the world. Hiltron is now active on a global satellite monitoring system for installation at sites in the USA, Latin America and again in South America." "As well as meeting with existing and potential customers, we will be talking to many of our key suppliers whose products are often selected by the Hiltron engineering team for integration into systems of our own design. Examples include satellite earth stations, terrestrial network head-ends and news-gathering vehicles." "We will also be promoting Hiltron-manufactured solutions such as automatically steered antenna mounts, antenna de-icers, monitoring and control software. Among these is our flagship HSACU control unit which is designed for use with three-axis motorised antennas such as the 4.9 metre dish-capacity Super-HMAM."